I saw this quote yesterday and it connected, it made real sense. You can apply it just as easily to making work, being creative, or taking a much bigger step in life. I remember, many years ago, someone saying "if you have something to fall back on, you will". I think that's very true, you can't move forward if you know you can safely move back. 'But when I said that nothing had been done I erred in one important matter. We had definitely committed ourselves and were halfway out of our ruts. We had put down our passage money--booked a sailing to Bombay. This may sound too simple, but is great in consequence. Until one is committed, there is hesitancy, the chance to draw back, always ineffectiveness. Concerning all acts of initiative (and creation), there is one elementary truth the ignorance of which kills countless ideas and splendid plans: that the moment one definitely commits oneself, the providence moves too. A whole stream of events issues from the decision, raising in one's favor all manner of unforeseen incidents, meetings and material assistance, which no man could have dreamt would have come his way"
The quote was in the fantastic new book by Lloyd Kahn and the Shelter crew. 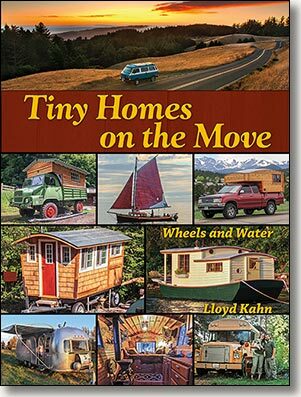 Tiny Homes On The Move. A follow up to that amazing book Tiny Homes Simple Shelter. This one focuses on homes that move. Converted vans, gypsy vardos, boats, you name it... if it moves it's been converted. As always these books are just so rich with imagery, hundreds of photos. Jam packed with inspiring stories and people, along with lots of links to their cool blogs following their adventures. I highly recommend buying both these books, even if you never plan on going Tiny or hitting the road. They give you dream space by the bucket load!